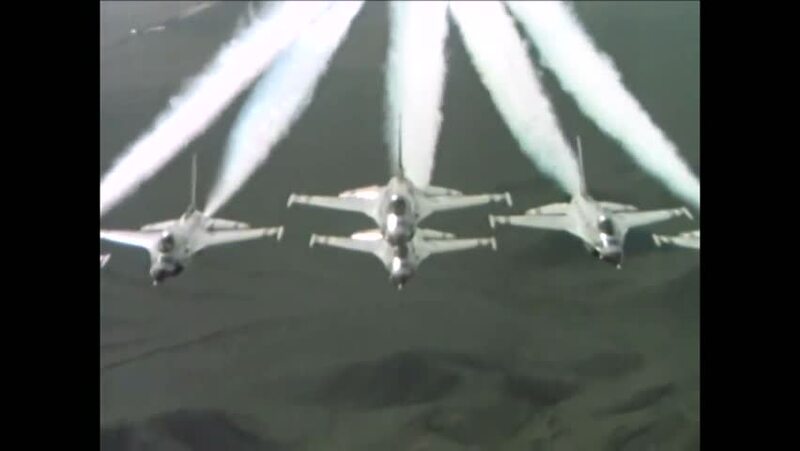 CIRCA 1986 - Squadrons of F-16 Thunderbirds do maneuvers in flight. hd00:39CIRCA 1944-Military planes fire and drop bombs on Germans at Normandie, and allied troops arrive on the beaches of Normandie during WWII. hd01:16CIRCA 1945 - The US 21st bomber command takes off from Saipan for Japan. hd00:44CIRCA 1940s - American aircrafts depart from the flight deck of the USS Franklin to engage in battle with Japanese kamikaze pilots in 1944 .
hd01:141950s: Air strikes and Navy guns blast the Korean peninsula during the Korean War in 1952.
hd01:29CIRCA 1968 - Air Force F-100 fighter jets attack and drop napalm on enemy targets on February 1st, 2nd, 4th, and 5th during the Vietnam War.